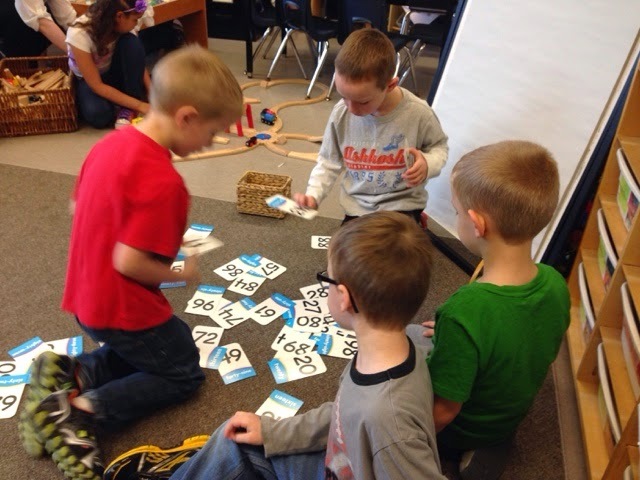 Today during activity time some of our children were interested in exploring the new number cards in our classroom. 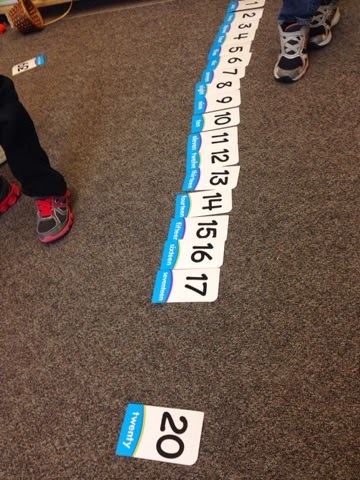 After placing them on the carpet, they began to look for familiar numbers. We challenged the children to order the cards from 1 to 50. 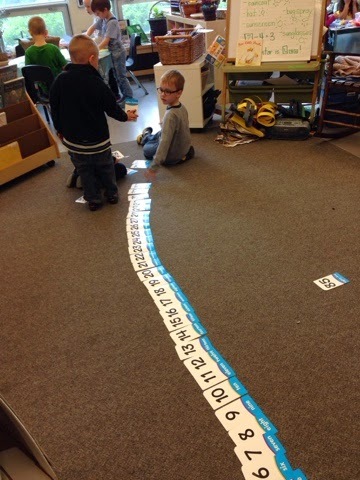 They immediately began to find the first few numbers and place them in a number line. The number line grew as the children worked together, naming the numbers aloud and helping each other identify more difficult numbers. It was interesting to see their strong number sense in this activity. 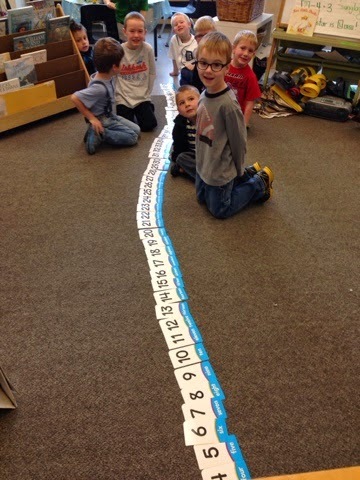 They became more efficient ordering the cards; as they found numbers close to the ones needed in the number line, they would place them in an approximate spot. In the following photo you can see that the numbers 1 - 6 have been found already. 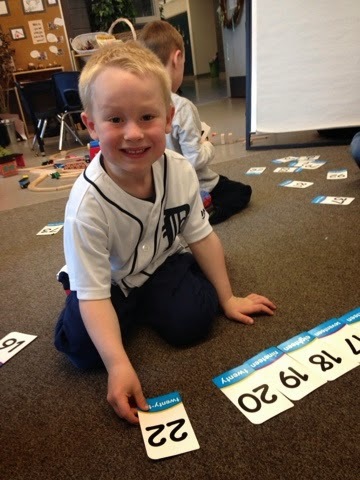 This child has located the numbers 9 and 10 and placed them in their corresponding spot in the number line, leaving room for the numbers 7 and 8. 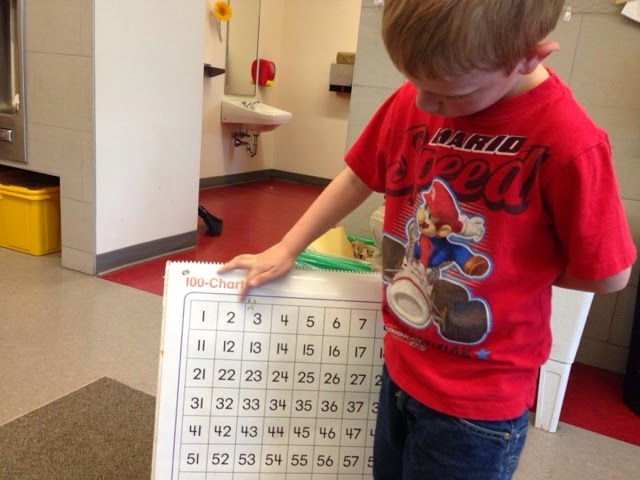 We made available a hundreds chart as reference. This was placed near the activity as a support for the children. 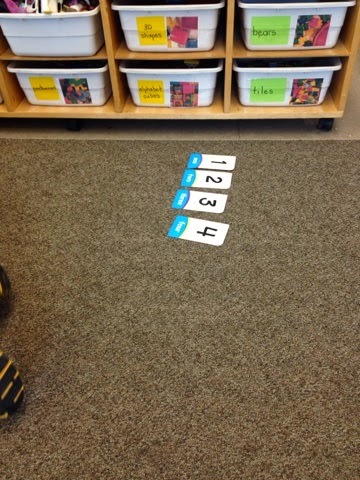 The children would count the numbers already found in the number line and then look to see what number should come next. This helped reinforce counting and number recognition skills. The children found a system that worked to help them complete the number line quickly and accurately. 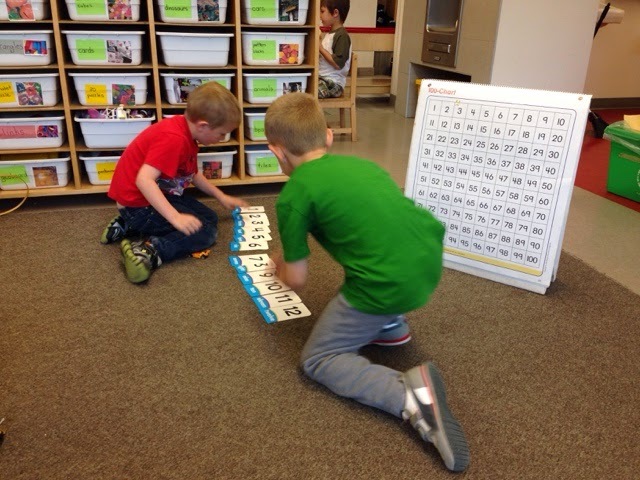 Some children placed randomly chosen numbers in their approximate spots and others worked to fill in the gaps. What a huge accomplishment! In a little over 15 minutes the numbers were all placed in correct order! After checking our work by counting and tapping the numbers on the line, the children posed for a celebratory photo! Strong number sense in kindergarten is an important indicator of future math proficiency. Recognizing what a number is, what is represents, and how it relates to other numbers gives children a solid base for other math activities. Number sense is the heart of our math program and is intertwined in all other math areas (e.g., geometry, patterning, data management). 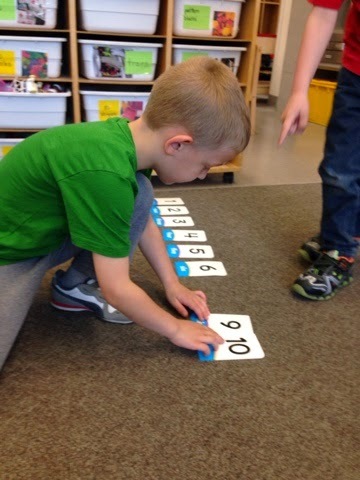 Ordering number cards is an excellent activity for home practice for families who wish to engage their children in additional math experiences. Children can number the cards in natural order, or use other patterns in the numbers (e.g., ordering the cards by 2s, 5s, 10s; ordering the cards in decreasing value).